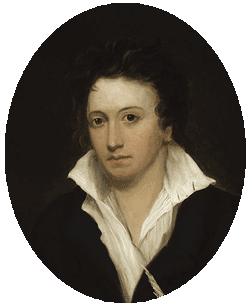 ● Percy Bysshe Shelley was born in 1792 in the south of England where his father was a member of parliament. ● He studied at Eton and then Oxford University where he gained the reputation as something of a rebel and radical thinker. ● In 1811, after being expelled from Oxford, he eloped to Edinburgh with a young woman, Harriet Westbrook, where - against opposition from family - they married. It caused a scandal. They had 2 children but eventually separated. ● In 1813 he began to publish his poems - becoming one of the leading advocates of the Romantic movement, his verse proving to be both powerful and sensitive; socially visionary and yet personally reflective. ● He began a relationship in 1814 with Mary Godwin and the two travelled widely in Europe, associating with fellow poet Lord Byron (Mary was the author of the famous Gothic novel Frankenstein, which was written at this time). ● In 1816 his wife died, having tragically drowned herself, and shortly after, he and Mary were married and moved to Italy. ● His time on the continent was a very productive for his writing, but further marred by tragedy. Two of their children died, and in 1822 Shelley himself was drowned in a storm at sea just a month before his thirtieth birthday. He was sailing off the coast of Italy at the time. ● Although Shelley's work was not particularly well-received during his own short lifetime, he did become a source of inspiration for the poets and painters of the Pre-Raphaelite movement a little later in the 19th century, including Browning, Tennyson, Swinburne and Dante Gabriel Rossetti.